Twenty nine rowers and coxswains will be representing Team BC at the Canada Summer Games, racing in fourteen different events over the course of four race days. The rowing component of the 2017 Canada Summer Games will take place in Kenora, Ontario with racing beginning on July 31st. Of these athletes, four will also be representing Canada this Summer on the CanAmMex Team or U23 National Team. Four of the Team BC athletes have been previously identified as top performers and are financially supported through the Rowing BC Gold Medal Pathway Program. The Rowing BC Gold Medal Pathway Program (formerly known as the BC Athlete Assistance Program) is an athlete-centered program of financial assistance that provides support to BC performance rowers striving to represent Canada in recognized national or international competition. The program seeks to relieve some of the financial pressures associated with training and competition needs associated with participation in national and international sport. The team will take part in a training camp at Elk Lake July 6-9th in combination with representing the Provincial Team at the BC Championships/Challenge West regatta. 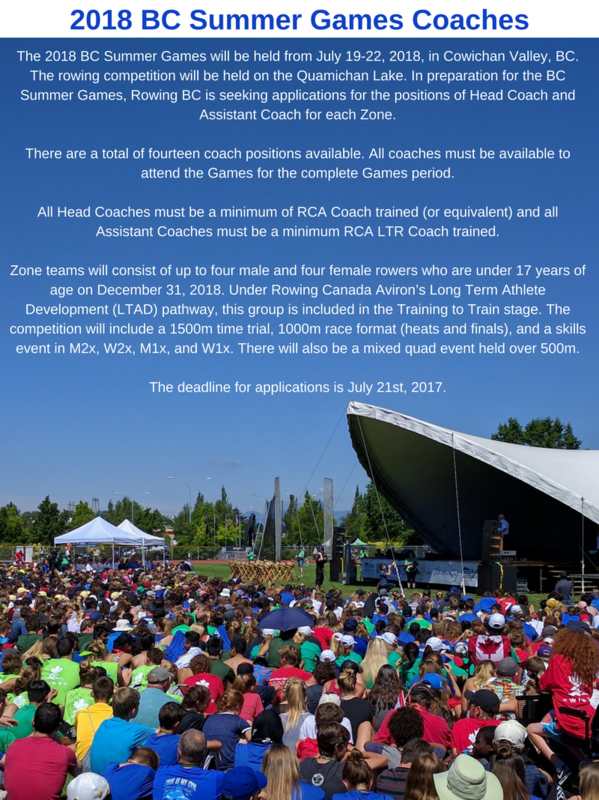 A pre-departure camp will take place at the UBC Boathouse in Richmond, BC beginning July 21st. The team will fly out to Winnipeg July 27thto partake in the Opening Ceremonies of the Games. Follow and support Team BC on social media throughout the lead up to and during the Games using #BeMoreBC and #JCG2017.